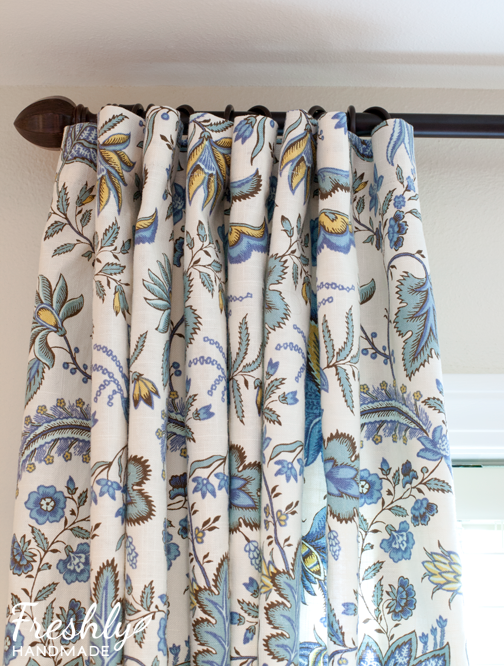 I just finished the master bedroom curtains as part of my Summer Spruce Up series and thought I would share the steps I took to create them using the hook and ring hanging method. 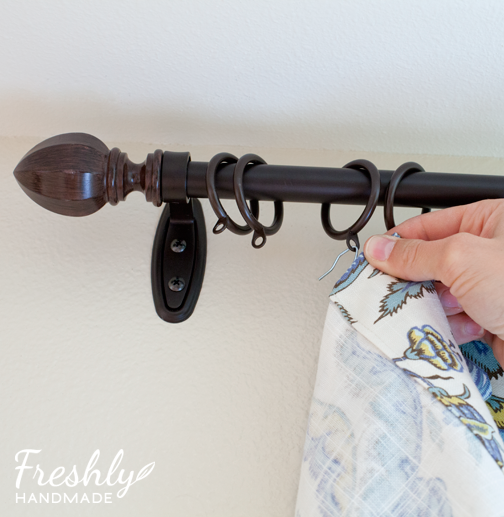 There are many different ways you can hang curtains including ring clips, grommets, hidden tabs or just by the rod pocket, to name a few. When I want a sophisticated look without being too fussy, I like to use drapery hooks and hardware rings to hang curtains. Here is how I achieve the look. Curtain fabric - for one panel you will need enough for your finished length plus 8-9" x the width of the fabric. For instance, I knew I wanted my finished curtains to be 92" long so I cut at 101". The width of my fabric was 54". Choose fabric that has a nice drape, but is not too flimsy. I've noticed that it's hard to find drapery rings without the clip. As long as the ring has a loop/hole on it and the clip is removable, they are suitable. Cut the fabric to the dimensions you need (see first item on material list). Cut off any selvages on the width. You are going to want to consider the size of your drapery rod and rings, where you want to hang the rod, and where you want the bottom of the curtains to fall. For floor to ceiling curtains, I like to hang them 1-2" from the ceiling and I like them to "pool" just a tad on the floor. You can use this tutorial for any curtain length however. As long as you know your desired finished length and add the 8-9" before you cut, you're good to go. 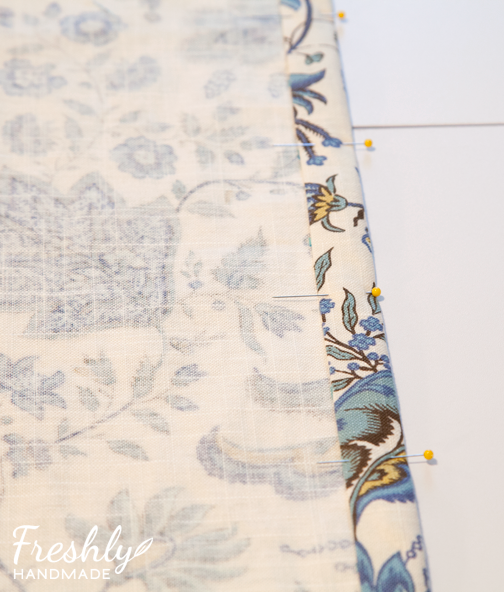 Starting with the sides and the wrong side of your fabric facing up, you are going to mark for your first fold for the seam using a water-soluble marking pen and measuring tape or ruler. 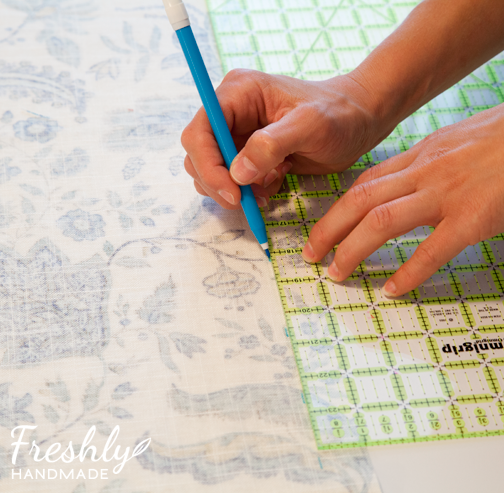 Your first fold is 1/2" but you are going to mark at 1" along the entire side of the fabric. You can do one side at a time or you can do both sides at the same time. 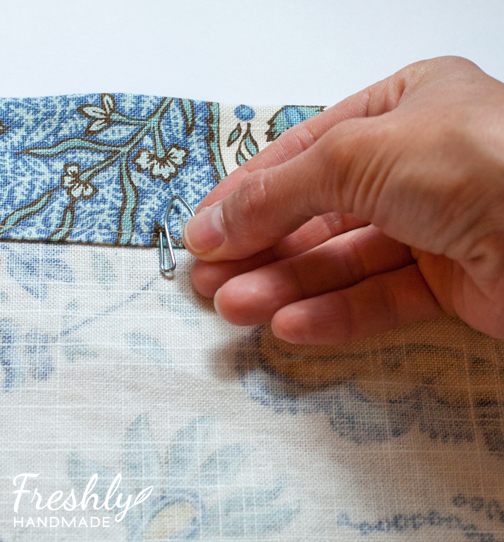 Fold the fabric up to the 1" mark along the entire side to create your 1/2" seam fold. Pin in place along the top edge with the pins parallel to edge. Press along the fold with the tip of your iron making sure not to iron over your pen marks as some can become permanent with heat applied. Remove pins. Again along the side, mark for your second fold at 2" from the edge of your first fold. 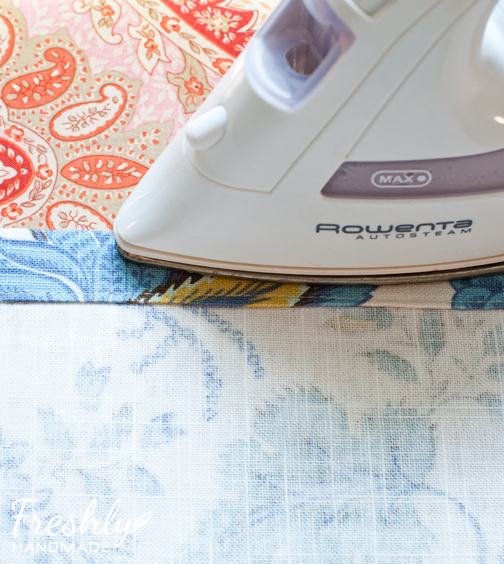 Do this along the entire length of the fabric. 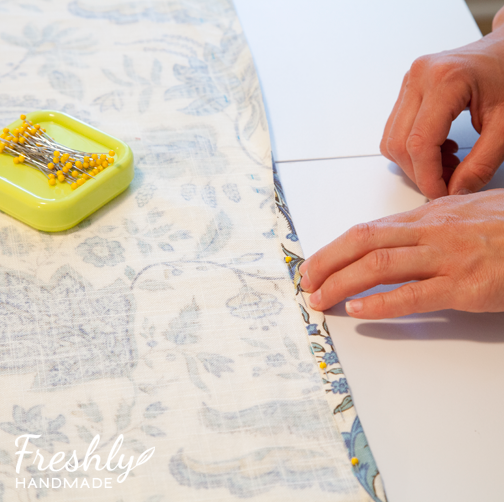 Fold the fabric up to the 2" mark to create your 1" side seam. 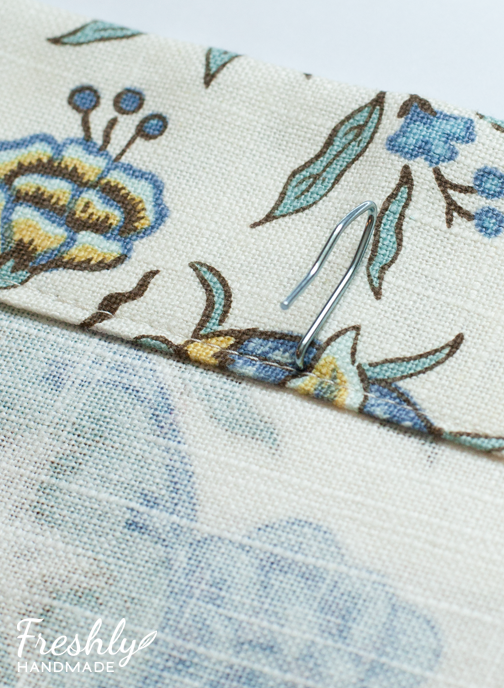 Pin along the entire length of the fabric with the pins perpendicular and the pin heads to the right of the edge. Straight stitch 1/8" from the inside edge (the first fold) to secure the seam. Remove pins as you sew. At this point, I like to remove any markings from my water-soluble pen. To do so, you can either spray the markings with a water bottle or simply dip your finger in water and rub the marking away. This will depend on the type of fabric you are using. Press the seam flat. 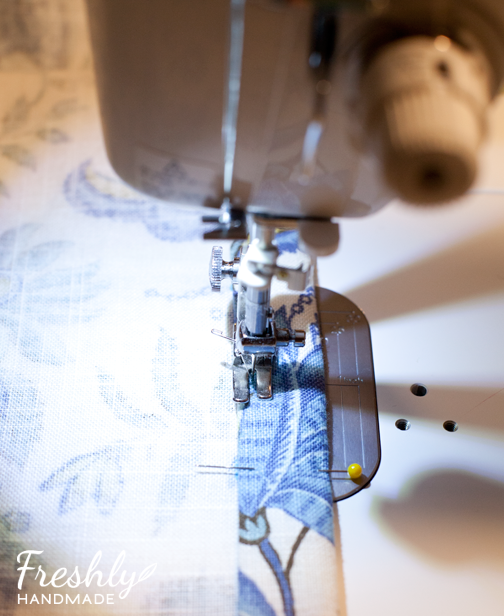 Repeat steps 2-8 to create seams for your other side, bottom and top. Use the illustration below as your guide for your first and second fold dimensions. Sides: 1/2" first fold, 1" second fold. Top: 1" first fold, 2" second fold. Remember that when you are marking, you need to double the number to achieve the finished fold width. 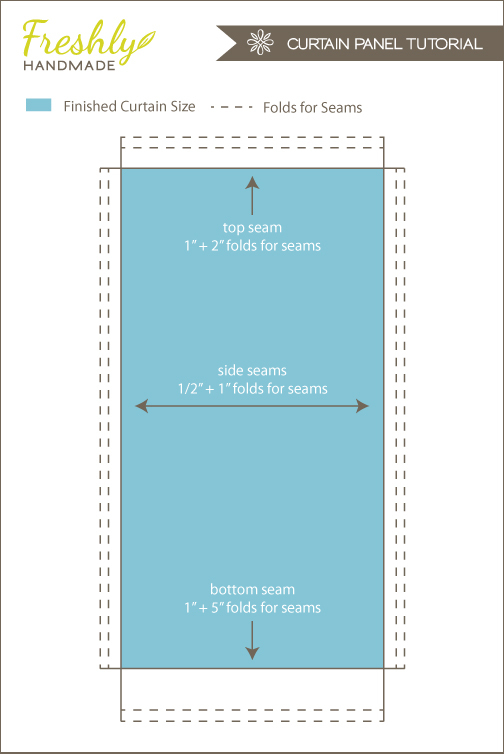 For a 5" bottom seam, I'd mark for my second fold at 10" from the bottom. Insert your drapery hooks to the back of the top seam evenly. The number of hooks you use is really up to you. Using more hooks gives you more "pleats". Most drapery rings come in packages of 7, but I used 9 rings and hooks for each panel to achieve the look I wanted. Make sure your hook is not poking through the front side of the fabric. 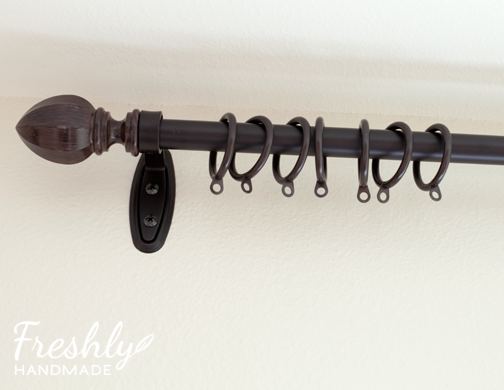 Install your drapery rod according to the manufacturer's instructions at your desired height. Use a level to make sure your rod is straight. 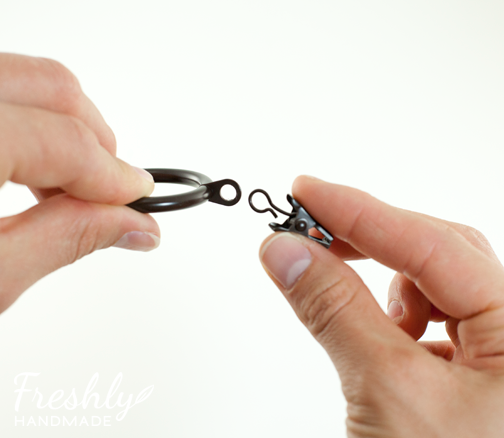 If your rings come with a clip, remove the the clip before putting the rings on the rod. Insert the hooks from the back of the curtain into the appropriate ring hole on the rod. Straighten the panel to get the look you want and you're done! I hope this tutorial was helpful. If you have any questions, let me know. 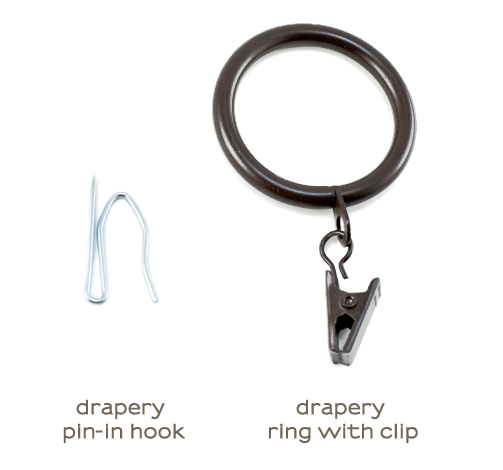 Question: Is there a reason to attach the drapery hooks instead of just using the clips that accompany the rings? Ruth - you certainly can use the clips to hang the curtains from the top, I just prefer the look of having rings, but not the clips. How do you know if your fabric is wide enough? Should it be double the width of the window so it will look full? Lisa - it really depends on how you want the curtains to function. Mine were just for decoration and I use my blinds for privacy so I just used the width of the fabric (around 54") for each panel. If you want to pull them closed for privacy or darkness, it really is up to you how you want them to look in the closed position. 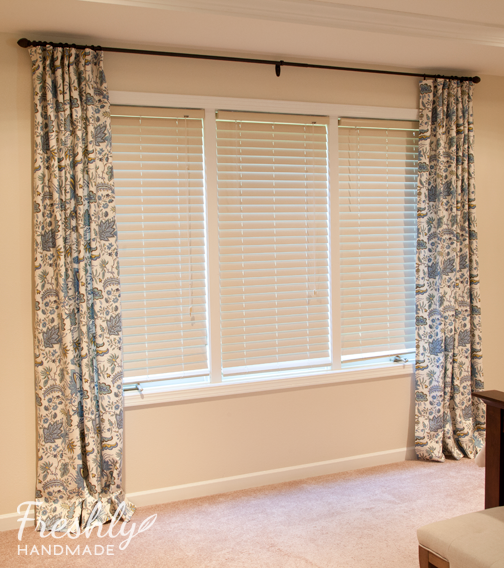 Curtains that equal the width of the window are going to have a flat look when closed. The more fabric you add to that, the more wave or fullness the curtains will have. I hope that answers your question. I noticed you didn't use buckram in the top header, and yet your spaces don't sag. Is it because you used a heavier fabric? I'm making a set for someone and an trying to figure out if I need buckram. The fabric is a heavier linen, but I think because I used nine rings/hooks per panel it helped to hold up the fabric without any other stabilizer. so, about 6 inches in between each ring/hook? Thanks in advance! Thank you so much for posting this information! I wanted this look but was having difficulty finding the "how to" info. Your explanation and pictures are great! So glad to hear that! I too, found it difficult to find good information so I figured there might be others out there that could benefit from this tutorial. Gorgeous! I even love the fabric you have in your post. I have probably a silly question- but I am dealing with pre-made panels and while they already have a pocket for the rod...due to the corner configuration of my windows (surrounding fireplace- 2 flanking- 2 adjacent) I need rings to let the panels slide without issue into the corner rod piece. I have the rings with clips, but I realllly think the hooks give it more of a finished look. I may have to use the clips until I get brave enough to pierce my panels. lol But thanks for the tutorial- I'm banging my head on window coverings, new house, curtains I like, finding the hardware I need/want. This gives me hope and I LOVE your fabric! Thanks for sharing this, it's very useful. Can you also advise on how one can use the clips instead of the hooks? The clips hold the top of the panel, therefore, they will be visible. I cannot really see how you made the folds. If you could draw a picture for me that would be great. Your blue measured drawing does not give the detail. I just am unable to distinguish the folds in your pictures. Hi, where is your drapery rod from in this post? Hi Stacy! Absolutely loved your idea and the photos are awesome! I loved the fabric you used, where did you get it?? Thank you! I have used this technique on 2 window treatments already and love the effect - Thank you!~ What can I do with the leftover clips? Thank you so much for a GREAT tutorial. This expained very well exactly what I want to do! Thank you for this fabulous tutorial! I just touched a sewing machine for the first time on Saturday. Following your tutorial, I made a professional looking drape (don't look too closely to my stiching) and could not be happier! Only 3 more to go! Thank you! I bought mine at Bed Bath and Beyond. Just about anywhere they sell rods. Big Lots has them. Thank you, this was so very helpful. I just have one question: is there a way to make the folds at the top continue to the bottom of the curtain. 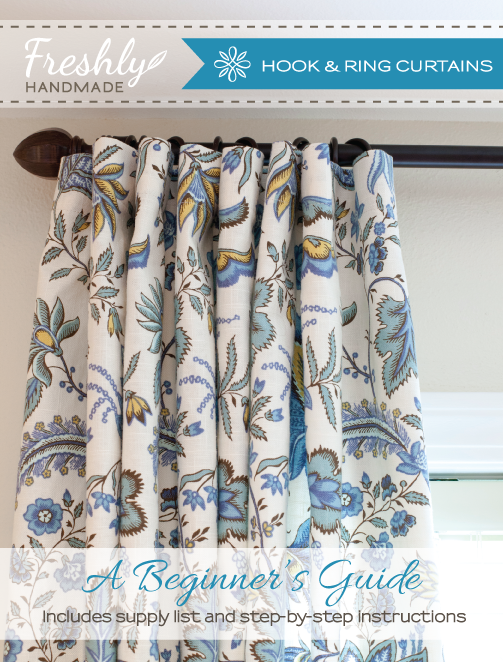 I apologize for commenting so long after this was posted, but I find it very frustrating when I can't make the drapes hang in a uniform way - and there is a serious shortage of helpful tutorials like this one. Sorry, I just thought of something else... are there any general rules about the size of the rings? My rod is about 1" in diameter but I was wondering if larger rings might look nice. So drapery hooks come in the brown or copper? How far apart did you space your hooks? I am trying to decide if Should use buckram or not. thank you!